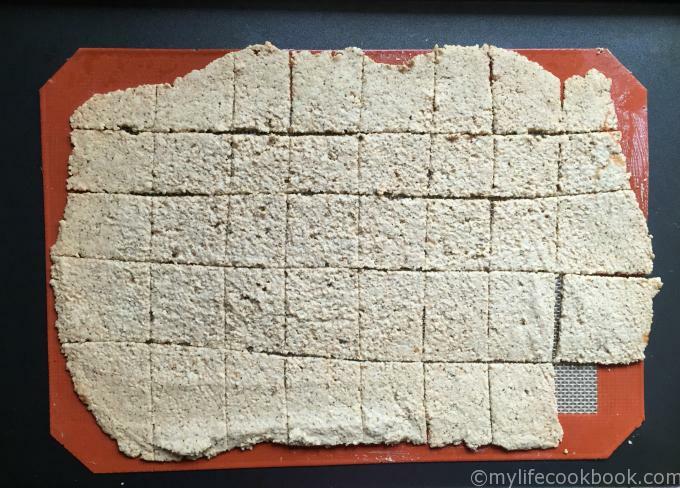 Easy Cashew Low Carb Crackers - a gluten free snack! 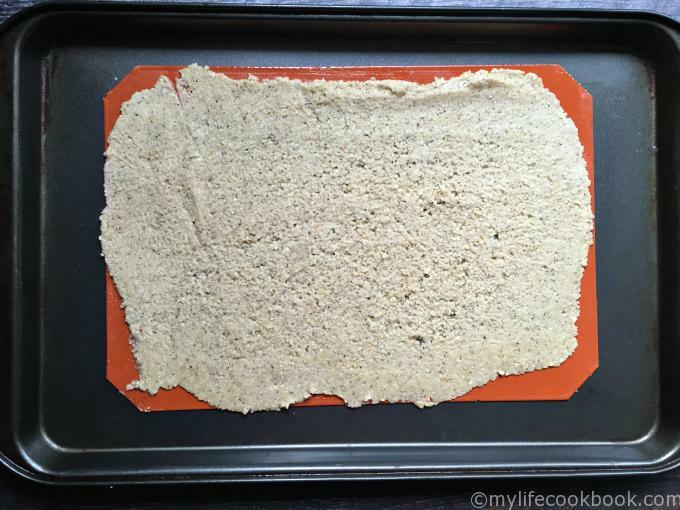 These easy cashew low carb crackers are so easy and they are grain free. All you need are cashews, egg whites and spices to make this low carb and tasty cracker. 10 crackers have 5.3g net carbs. 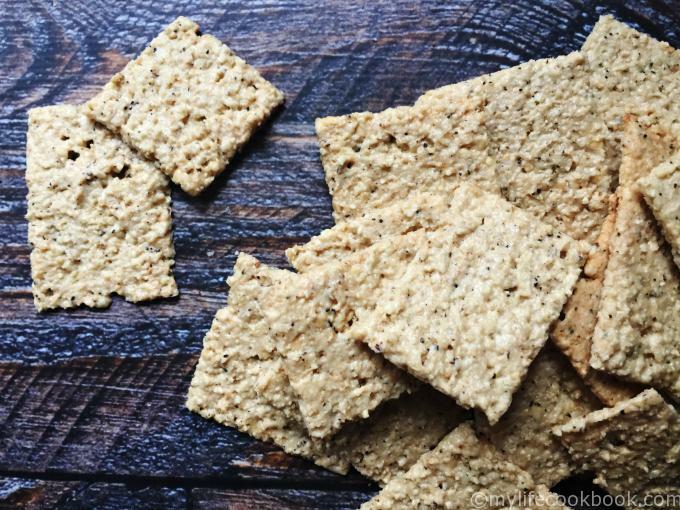 You might also like these low carb everything crackers. Today I was thinking about something that I used to make years and years ago. It was lebnah, a creamy cheese spread you make from yogurt and something I learned from my father. He was not that adept in the kitchen so that is telling you how easy it is to make. <sigh>I miss him…he was a great dad. Anyway, he would eat it with pita bread but since I’m trying to stay gluten free I remembered these easy cashew low carb crackers that I thought would go perfectly with the yogurt cheese spread. They are super simple to make and only consist of cashews, eggs and spices so I don’t know why I don’t make them more often. My hubby loves them and they go quickly in our house. First you need some cashew meal, which is just ground up raw cashews. I buy a bag of this every time I go to Trader Joe’s because it’s cheap and convenient. But if I didn’t have any, I would just grind some raw cashews up in a food processor. Start by adding cashew meal to a bowl. Then add the egg whites and spices so that it makes a dough. For these crackers I used the same recipe as my Almond Thins recipe so I mixed in garlic powder, salt, pepper and onion powder. Roll it out on a silpat or a piece of parchment paper. I usually spray a piece of wax paper with cooking spray and place on top because the dough is sticky. Then use a rolling pin to get it as thin and as even as possible. I could have cleaned this up a bit before I took the picture. I could have cut the edges off to make it nice and straight. But then again I could have cleaned my whole house which REALLY needs it instead of making these crackers. 😉 So if you are more of a perfectionist than me, I’m sure you will do a better job at rolling and cutting these little crackers. After you have it rolled out you want to score it with a pizza cutter. Just do it gently. The cut shouldn’t go all the way through the dough. Next, put the cookie sheet in a 325 degree oven for 12 -15 minutes. After 15 minutes, check to make sure they are not burning. Turn off the oven but keep them in there for another 20 or 30 minutes so that they get harder. Check every once in awhile to see that they aren’t burning. You probably can’t even tell from this photo that they are done, but they are. You can keep them in longer if you like them crispier. Just keep checking. And here is the final product. These cashew crackers are so easy and they are grain free. 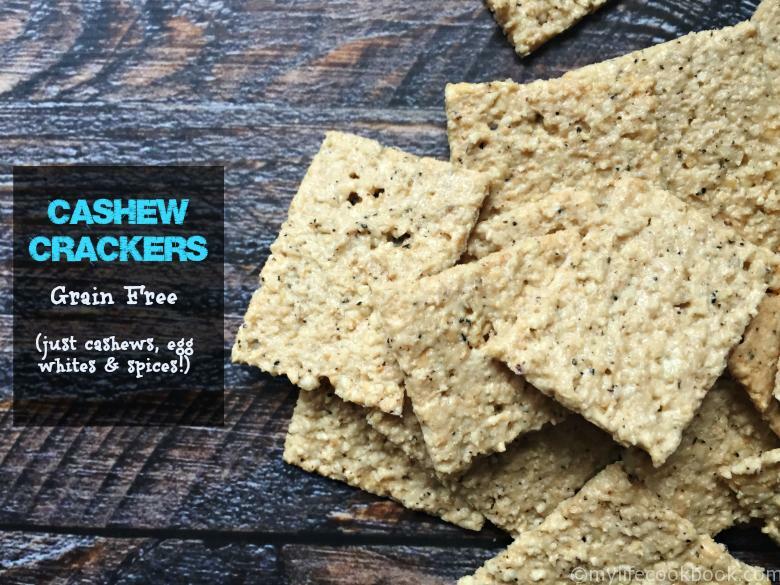 All you need are cashews, egg whites and spices to make this low carb and tasty cracker. In a bowl mix all your ingredients to make a dough. Roll out your dough on a silpat lined cookie sheet or a parchment lined cookie sheet. I use a piece of wax paper sprayed with cooking sheet and place on top of the dough and roll out with a rolling pin. Try to get your dough as thin and as even as possible. Score your dough with a pizza cutter but be carefully not to cut all the way through. Bake for 12-15 minutes and then turn off the oven. Keep the crackers in the oven for an additional 20-30 minutes until they are hard enough. Pull off the outside crackers if they start to get too brown. Your comment about your house cracked me up, because mine is the same way! I’ve never tried making crackers before…these look great! My new daughter-in-law will love these! Thanks for sharing! These sound yummy! I haven’t made my own crackers before, pinning to try. G’day I love the sound of these! Great recipe! Great idea! 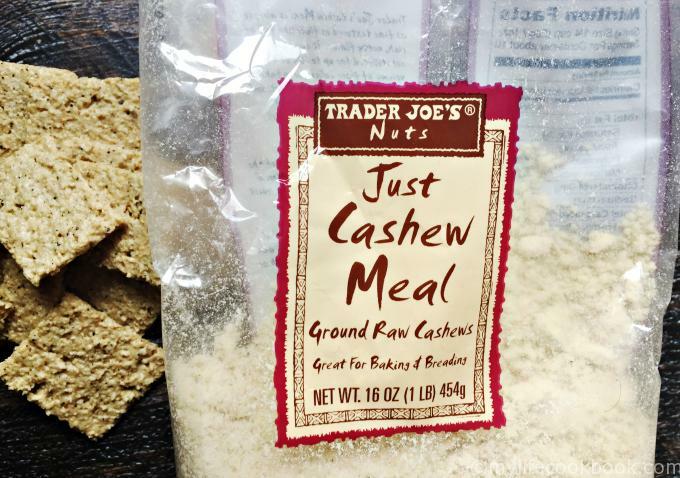 We love eating cashews at home so I must try this! I hope you do try them and I hope you like them! 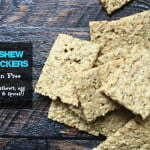 Ooh I love cashews, these crackers are an awesome idea! If you like cashews you will really like these. Super easy and yummy snack! Oh very clever. I eat a lot of nuts so I’m sure I would love these. We eat a lot of nuts in this household so hence all the nut recipes!